Throughout the day the group wrote poems, as a way of focussing their minds on the experiences and distilling deep-felt reactions into words. But the process of writing itself brought up issues for many. One person described themselves as illiterate; dictating lines of poems to be written down by a 'scribe' was a powerful experience, a disturbing luxury. To be allowed onto paper, to be acknowledged after so long! It's a delight that can bring pain. Another group member told us that they'd never been praised, so to suddenly be told that a piece of writing was good was far more challenging than the usual round of expected abuse. 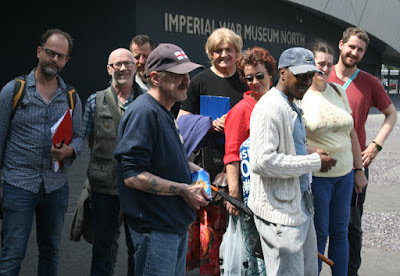 Visiting the exhibition with the group from The Booth Centre, gave us insights into both this exhibition and the afternoon visit to the Imperial War Museum North. Together we form a group from disparate backgrounds, cultures, ages, genders, many of whom have experienced or who are still experiencing rough sleeping, life on the margins. But this time the conversation and tears shed, were directed at the trauma of the other people, the refugees fleeing across the Indian sub-continent in the largest ever human mass migration. Or meeting and conversing with David, a World War 2 veteran who'd fought at Juno Beach during D-Day, and then in the vicious Battle of the Bulge in the Ardennes, at the IWMN. David described fighting for his life against hostile forces, and the elements. Our group listening to him nodded their heads; many of them have faced those things over and over again. The poems that we worked on were love poems to weapons. They're strong pieces of writing, but what also exists in these pieces, and at times overwhelms the words on the page, is the story between the lines. A big thank you to... Danielle Garcia at IWMN for arranging our afternoon, to Mathew for sharing his wonderful knowledges and patiently answering all our questions and most of all to David, the World War 2 veteran, who brought the conflict and aftermath alive.